Before the Apollo 11 moon landing in 1969, NASA began early studies of space shuttle designs. In 1969, President Richard Nixon formed the Space Task Group, chaired by Vice President Spiro Agnew. This group outlined ambitious post-Apollo missions centered on a large permanently manned space station, a small reusable logistics vehicle that would support it, and ultimately a manned mission to Mars. Smaller goals included a variety of space vehicles for moving spacecraft around in orbit. Presenting the plans to Nixon, Agnew was told that the administration would not commit to a Mars mission, and limited activity to low Earth orbit for the immediate future. He was then told to select one of the two remaining proposals. After some debate between the station and the vehicle, the vehicle was chosen; suitably designed, such a spacecraft could perform some longer-duration missions and thus fill some of the goals of the station, and over the longer run, could help lower the cost of access to space and make the station less expensive. The goal, as presented by NASA to Congress, was to provide a much less-expensive means of access to space that would be used by NASA, the Department of Defense, and other commercial and scientific users. 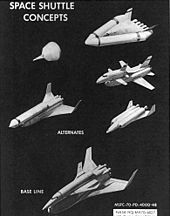 During early shuttle development there was great debate about the optimal shuttle design that best balanced capability, development cost and operating cost. Ultimately chosen was a design using a reusable winged orbiter, reusable solid rocket boosters, and an expendable external fuel tank for the orbiter's main engines. 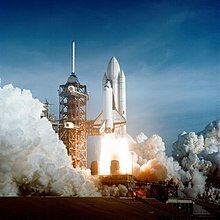 The shuttle program was formally launched on January 5, 1972, when President Nixon announced that NASA would proceed with the development of a reusable space shuttle system. The stated goals of "transforming the space frontier...into familiar territory, easily accessible for human endeavor" was to be achieved by launching as many as 50 missions per year, with hopes of driving down per-mission costs. The prime contractor for the program was North American Rockwell (later Rockwell International, now Boeing), the same company responsible for building the Apollo Command/Service Module. The contractor for the Space Shuttle Solid Rocket Boosters was Morton Thiokol (now part of Northrop Grumman Innovation Systems), for the external tank, Martin Marietta (now Lockheed Martin), and for the Space Shuttle main engines, Rocketdyne (now Aerojet Rocketdyne). The first orbiter was originally planned to be named Constitution, but a massive write-in campaign from fans of the Star Trek television series convinced the White House to change the name to Enterprise. Amid great fanfare, Enterprise (designated OV-101) was rolled out on September 17, 1976, and later conducted a successful series of glide-approach and landing tests in 1977 that were the first real validation of the design. STS-1 at liftoff. The External Tank was painted white for the first two Space Shuttle launches. From STS-3 on, it was left unpainted. . The first two missions had tanks painted white, this elimination saved some weight (about 600 lbs / 272 kg). Decades later, some questioned if the paint might have prevented the ice-soaked foam shedding issue that led to the destruction of Columbia. 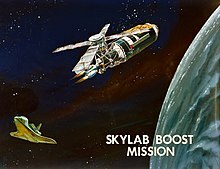 It was originally hoped that the Shuttle Program might be able to rejuvenate Skylab, but the Shuttle was not yet ready to fly when Skylab re-entered Earth's atmosphere —partially because higher than expected solar activity caused accelerated decay of Skylab's orbit. All Space Shuttle missions were launched from the Kennedy Space Center (KSC). The weather criteria used for launch included, but were not limited to: precipitation, temperatures, cloud cover, lightning forecast, wind, and humidity. The Shuttle was not launched under conditions where it could have been struck by lightning. The first fully functional orbiter was Columbia (designated OV-102), built in Palmdale, California. It was delivered to Kennedy Space Center (KSC) on March 25, 1979, and was first launched on April 12, 1981—the 20th anniversary of Yuri Gagarin's space flight—with a crew of two. Challenger (OV-099) was delivered to KSC in July 1982, Discovery (OV-103) in November 1983, Atlantis (OV-104) in April 1985 and Endeavour in May 1991. Challenger was originally built and used as a Structural Test Article (STA-099), but was converted to a complete orbiter when this was found to be less expensive than converting Enterprise from its Approach and Landing Test configuration into a spaceworthy vehicle. On April 24, 1990, Discovery carried the Hubble Space Telescope into space during STS-31. In the course of 135 missions flown, two orbiters (Columbia and Challenger) suffered catastrophic accidents, with the loss of all crew members, totaling 14 astronauts. The accidents led to national level inquiries and detailed analysis of why the accidents occurred. There was a significant pause where changes were made before the Shuttles returned to flight. The Columbia disaster occurred in 2003, but STS took more than a year off before returning to flight in June 2005 with the STS-114 mission. The previous break was between January 1986 (when the Challenger disaster occurred) and 32 months later when STS-26 was launched on September 29, 1988. The longest Shuttle mission was STS-80 lasting 17 days, 15 hours. The final flight of the Space Shuttle program was STS-135 on July 8, 2011. Since the Shuttle's retirement in 2011, many of its original duties are performed by an assortment of government and private vessels. The European ATV Automated Transfer Vehicle supplied the ISS between 2008 and 2015. Classified military missions are being flown by the US Air Force's unmanned space plane, the X-37B. By 2012, cargo to the International Space Station was already being delivered commercially under NASA's Commercial Resupply Services by SpaceX's partially reusable Dragon spacecraft, followed by Orbital Sciences' Cygnus spacecraft in late 2013. Crew service to the ISS is currently provided by the Russian Soyuz while work on the Commercial Crew Development program proceeds; the first crewed flight of this is planned for July 2019, on the SpaceX Falcon 9 with Dragon 2 crew capsule. For missions beyond low Earth orbit, NASA is building the Space Launch System and the Orion (spacecraft). European astronauts prepare for their Spacelab mission, 1984. Astronauts Thomas D. Akers and Kathryn C. Thornton install corrective optics on the Hubble Space Telescope during STS-61. Space Shuttle Atlantis takes flight on the STS-27 mission on December 2, 1988. The Shuttle takes about 8.5 minutes to accelerate to a speed of over 27,000 km/h (17000 mph) and achieve orbit. A drag chute is deployed by Endeavour as it completes a mission of almost 17 days in space on Runway 22 at Edwards Air Force Base in southern California. Landing occurred at 1:46 pm (EST), March 18, 1995. Early during development of the space shuttle, NASA had estimated that the program would cost $7.45 billion ($43 billion in 2011 dollars, adjusting for inflation) in development/non-recurring costs, and $9.3M ($54M in 2011 dollars) per flight. Early estimates for the cost to deliver payload to low earth orbit were as low as $118 per pound ($260/kg) of payload ($635/lb or $1,400/kg in 2011 dollars), based on marginal or incremental launch costs, and assuming a 65,000 pound (30 000 kg) payload capacity and 50 launches per year. A more realistic projection of 12 flights per year for the 15-year service life combined with the initial development costs would have resulted in a total cost projection for the program of roughly $54 billion (in 2011 dollars). The total cost of the actual 30-year service life of the shuttle program through 2011, adjusted for inflation, was $196 billion. The exact breakdown into non-recurring and recurring costs is not available, but, according to NASA, the average cost to launch a Space Shuttle as of 2011 was about $450 million per mission. Per-launch costs can be measured by dividing the total cost over the life of the program (including buildings, facilities, training, salaries, etc.) by the number of launches. With 135 missions, and the total cost of US$192 billion (in 2010 dollars), this gives approximately $1.5 billion per launch over the life of the shuttle program. A 2017 study found that carrying one kilogram of cargo to the ISS on the shuttle cost $272,000 in 2017 dollars, twice the cost of Cygnus and three times that of Dragon. NASA used a management philosophy known as success-oriented management during the Space Shuttle program which was described by historian Alex Roland in the aftermath of the Columbia disaster as "hoping for the best". Success-oriented management has since been studied by several analysts in the area. In 1986, Challenger disintegrated one minute and 13 seconds after liftoff. Video of Columbia's final moments, filmed by the crew. There was also one abort-to-orbit and some fatal accidents on the ground during launch preparations. Close-up video footage of Challenger during its final launch on January 28, 1986 clearly show it began due to an O-ring failure on the right solid rocket booster (SRB). The hot plume of gas leaking from the failed joint caused the collapse of the external tank, which then resulted in the orbiter's disintegration due to high aerodynamic stress. The accident resulted in the loss of all seven astronauts on board. 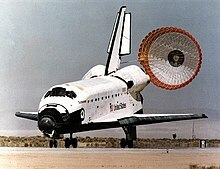 Endeavour (OV-105) was built to replace Challenger (using structural spare parts originally intended for the other orbiters) and delivered in May 1991; it was first launched a year later. After the loss of Challenger, NASA grounded the shuttle program for over two years, making numerous safety changes recommended by the Rogers Commission Report, which included a redesign of the SRB joint that failed in the Challenger accident. Other safety changes included a new escape system for use when the orbiter was in controlled flight, improved landing gear tires and brakes, and the reintroduction of pressure suits for shuttle astronauts (these had been discontinued after STS-4; astronauts wore only coveralls and oxygen helmets from that point on until the Challenger accident). The shuttle program continued in September 1988 with the launch of Discovery on STS-26. Recommendation I – The faulty Solid Rocket Motor joint and seal must be changed. This could be a new design eliminating the joint or a redesign of the current joint and seal. ... the Administrator of NASA should request the National Research Council to form an independent Solid Rocket Motor design oversight committee to implement the Commission's design recommendations and oversee the design effort. Recommendation II – The Shuttle Program Structure should be reviewed. ... NASA should encourage the transition of qualified astronauts into agency management Positions. Recommendation III – NASA and the primary shuttle contractors should review all Criticality 1, 1R, 2, and 2R items and hazard analyses. Recommendation IV – NASA should establish an Office of Safety, Reliability and Quality Assurance to be headed by an Associate Administrator, reporting directly to the NASA Administrator. Recommendation VI – NASA must take actions to improve landing safety. The tire, brake and nosewheel system must be improved. Recommendation VII – Make all efforts to provide a crew escape system for use during controlled gliding flight. Recommendation VIII – The nation's reliance on the shuttle as its principal space launch capability created a relentless pressure on NASA to increase the flight rate ... NASA must establish a flight rate that is consistent with its resources. The shuttle program operated accident-free for seventeen years after the Challenger disaster, until Columbia broke up on re-entry, killing all seven crew members, on February 1, 2003. The accident began when a piece of foam shed from the external tank struck the leading edge of the orbiter's left wing, puncturing one of the reinforced carbon-carbon (RCC) panels that covered the wing edge and protected it during re-entry. As Columbia re-entered the atmosphere, hot gas penetrated the wing and destroyed it from the inside out, causing the orbiter to lose control and disintegrate. 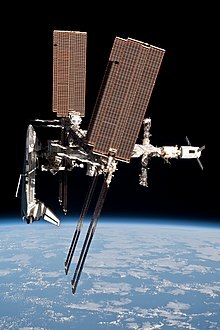 After the Columbia disaster, the International Space Station operated on a skeleton crew of two for more than two years and was serviced primarily by Russian spacecraft. While the "Return to Flight" mission STS-114 in 2005 was successful, a similar piece of foam from a different portion of the tank was shed. Although the debris did not strike Discovery, the program was grounded once again for this reason. The second "Return to Flight" mission, STS-121 launched on July 4, 2006, at 14:37 (EDT). Two previous launches were scrubbed because of lingering thunderstorms and high winds around the launch pad, and the launch took place despite objections from its chief engineer and safety head. A five-inch (13 cm) crack in the foam insulation of the external tank gave cause for concern; however, the Mission Management Team gave the go for launch. This mission increased the ISS crew to three. Discovery touched down successfully on July 17, 2006 at 09:14 (EDT) on Runway 15 at Kennedy Space Center. Following the success of STS-121, all subsequent missions were completed without major foam problems, and the construction of ISS was completed (during the STS-118 mission in August 2007, the orbiter was again struck by a foam fragment on liftoff, but this damage was minimal compared to the damage sustained by Columbia). The Columbia Accident Investigation Board, in its report, noted the reduced risk to the crew when a shuttle flew to the International Space Station (ISS), as the station could be used as a safe haven for the crew awaiting rescue in the event that damage to the orbiter on ascent made it unsafe for re-entry. The board recommended that for the remaining flights, the shuttle always orbit with the station. Prior to STS-114, NASA Administrator Sean O'Keefe declared that all future flights of the shuttle would go to the ISS, precluding the possibility of executing the final Hubble Space Telescope servicing mission which had been scheduled before the Columbia accident, despite the fact that millions of dollars worth of upgrade equipment for Hubble were ready and waiting in NASA warehouses. Many dissenters, including astronauts[who? ], asked NASA management to reconsider allowing the mission, but initially the director stood firm. On October 31, 2006, NASA announced approval of the launch of Atlantis for the fifth and final shuttle servicing mission to the Hubble Space Telescope, scheduled for August 28, 2008. However SM4/STS-125 eventually launched in May 2009. One impact of Columbia was that future crewed launch vehicles, namely the Ares I, had a special emphasis on crew safety compared to other considerations. NASA maintains extensive, warehoused catalogs of recovered pieces from the two destroyed orbiters. The Space Shuttle program was extended several times beyond its originally envisioned 15-year life span because of the delays in building the United States space station in low Earth orbit—a project which eventually evolved into the International Space Station. It was formally scheduled for mandatory retirement in 2010 in accord with the directives President George W. Bush issued on January 14, 2004 in his Vision for Space Exploration. The final Space Shuttle launch was that of Atlantis on July 8, 2011. Although the retirement was planned and roughly in line with what was expected out of STS without further upgrades, the planned replacement for the STS, the Constellation program was cancelled the year before STS concluded. The two programs that took its place, two undetermined commercial crew vehicles and SLS with Orion needed even more time to have a new launcher. NASA has continued to fly to the station via its Roscosmos partner, who still has a functioning manned launcher, the Soyuz system. Manned launch systems have been proposed by other countries, such as the ESA's mini-shuttle Hermes launched by an Ariane rocket, which was cancelled in 1992. Out of the five fully functional shuttle orbiters built, three remain. Enterprise, which was used for atmospheric test flights but not for orbital flight, had many parts taken out for use on the other orbiters. It was later visually restored and was on display at the National Air and Space Museum's Steven F. Udvar-Hazy Center until April 19, 2012. Enterprise was moved to New York City in April 2012 to be displayed at the Intrepid Sea, Air & Space Museum, whose Space Shuttle Pavilion opened on July 19, 2012. Discovery replaced Enterprise at the National Air and Space Museum's Steven F. Udvar-Hazy Center. Atlantis formed part of the Space Shuttle Exhibit at the Kennedy Space Center visitor complex and has been on display there since June 29, 2013 following its refurbishment. On October 14, 2012, Endeavour completed an unprecedented 12 mi (19 km) drive on city streets from Los Angeles International Airport to the California Science Center, where it has been on display in a temporary hangar since late 2012. The transport from the airport took two days and required major street closures, the removal of over 400 city trees, and extensive work to raise power lines, level the street, and temporarily remove street signs, lamp posts, and other obstacles. Hundreds of volunteers, and fire and police personnel, helped with the transport. Large crowds of spectators waited on the streets to see the shuttle as it passed through the city. Endeavour will be displayed permanently beginning in 2017 at the Samuel Oschin Air and Space Center (an addition to the California Science Center currently under construction), where it will be mounted in the vertical position complete with solid rocket boosters and an external tank. Ten people inside Spacelab Module in the Shuttle bay in June 1995, celebrating the docking of the Space Shuttle and Mir. One area of Space Shuttle applications is an expanded crew. Crews of up to eight have been flown in the Orbiter, but it could have held at least a crew of ten. Various proposals for filling the payload bay with additional passengers were also made as early as 1979. One proposal by Rockwell provided seating for 74 passengers in the Orbiter payload bay, with support for three days in Earth orbit. With a smaller 64 seat orbiter, costs for the late 1980s would be around 1.5 million USD per seat per launch. The Rockwell passenger module had two decks, four seats across on top and two on the bottom, including a 25-inch (63.5 cm) wide isle and extra storage space. Another design was Space Habitation Design Associates 1983 proposal for 72 passengers in the Space Shuttle Payload bay. Passengers were located in 6 sections, each with windows and its own loading ramp at launch, and with seats in different configurations for launch and landing. Another proposal was based on the Spacelab habitation modules, which provided 32 seats in the payload bay in addition to those in the cockpit area. During the three decades of operation, various follow-on and replacements for the STS Space Shuttle were partially developed but not finished. Shuttle II, Johnson Space Center concept for a follow-on, with 2 boosters and 2 tanks mounted on its wings. One effort in the direction of space transportation was the Reusable Launch Vehicle (RLV) program, initiated in 1994 by NASA. This led to work on the X-33 and X-34 vehicles. NASA spent about 1 billion USD on developing the X-33 hoping for it be in operation by 2005. Another program around the turn of the millennium was the Space Launch Initiative, which was a next generation launch initaive. The Space Launch Initiative program was started in 2001, and in late 2002 it was evolved into two programs, the Orbital Space Plane Program and the Next Generation Launch Technology program. OSP was oriented towards provided access to the International Space Station. According to the 2004 Vision for Space Exploration, the next manned NASA program was to be Project Constellation with its Ares I and Ares V launch vehicles and the Orion Spacecraft; however, the Constellation program was never fully funded, and in early 2010 the Obama administration asked Congress to instead endorse a plan with heavy reliance on the private sector for delivering cargo and crew to LEO. The Commercial Orbital Transportation Services (COTS) program began in 2006 with the purpose of creating commercially operated unmanned cargo vehicles to service the ISS. The first of these vehicles, SpaceX's Dragon, became operational in 2012, and the second, Orbital Sciences' Cygnus did so in 2014. The Commercial Crew Development (CCDev) program was initiated in 2010 with the purpose of creating commercially operated manned spacecraft capable of delivering at least four crew members to the ISS, staying docked for 180 days and then returning them back to Earth. These spacecraft, like the SpaceX Dragon V2 and Sierra Nevada Corporation's Dream Chaser are expected to become operational around the end of 2018. Although the Constellation program was canceled, it has been replaced with a very similar beyond low Earth orbit program. The Orion spacecraft has been left virtually unchanged from its previous design. The planned Ares V rocket has been replaced with the smaller Space Launch System (SLS), which is planned to launch both Orion and other necessary hardware. Exploration Flight Test-1 (EFT-1), an unmanned test flight of the Orion spacecraft, launched on December 5, 2014 on a Delta IV Heavy rocket. Exploration Mission-1 (EM-1) is the unmanned initial launch of the SLS, which is planned for 2019. Exploration Mission-2 (EM-2) is the first manned flight of Orion and SLS and is scheduled for 2023. EM-2 is a 10-14-day mission planned to place a crew of four into Lunar orbit. As of April 2018[update], the destination for EM-3 and immediate destination focus for this new program is still in-flux. The Space Shuttle program occupied over 654 facilities, used over 1.2 million line items of equipment, and employed over 5,000 people. The total value of equipment was over $12 billion. Shuttle-related facilities represented over a quarter of NASA's inventory. There were over 1,200 active suppliers to the program throughout the United States. NASA's transition plan had the program operating through 2010 with a transition and retirement phase lasting through 2015. During this time, the Ares I and Orion as well as the Altair Lunar Lander were to be under development, although these programs have since been canceled. in the 2010s, two major programs for human spaceflight were Commercial Crew Development and the Space Launch System with the Orion capsule. Kennedy Space Center Launch Complex 39 was, for example, used to launch a Falcon Heavy rocket. The Space Shuttle program has been criticized for failing to achieve its promised cost and utility goals, as well as design, cost, management, and safety issues. Others have argued that the Shuttle program was a step backwards from the Apollo Program, which, while extremely dangerous, accomplished far more scientific and space exploration endeavors than the Shuttle ever could. After both the Challenger disaster and the Columbia disaster, high-profile boards convened to investigate the accidents with both committees returning praise and serious critiques to the program and NASA management. Some of the most famous of the criticisms, most of management, came from Nobel Prize winner Richard Feynman, in his report that followed his appointment to the commission responsible for investigating the Challenger disaster. Many other vehicles were used in support of the Space Shuttle program, mainly terrestrial transportation vehicles. The Crawler-Transporter carried the Mobile Launcher Platform and the Space Shuttle from the Vehicle Assembly Building (VAB) to Launch Complex 39, originally built for Project Apollo. The Shuttle Carrier Aircraft (SCA) were two modified Boeing 747s. Either could fly an orbiter from alternative landing sites back to the Kennedy Space Center. These aircraft were retired to the Joe Davies Heritage Airpark at the Armstrong Flight Research Center and Space Center Houston. A 36-wheeled transport trailer, the Orbiter Transfer System, originally built for the U.S. Air Force's launch facility at Vandenberg Air Force Base in California (since then converted for Delta IV rockets) would transport the orbiter from the landing facility to the launch pad, which allowed both "stacking" and launch without utilizing a separate VAB-style building and crawler-transporter roadway. Prior to the closing of the Vandenberg facility, orbiters were transported from the OPF to the VAB on their undercarriages, only to be raised when the orbiter was being lifted for attachment to the SRB/ET stack. The trailer allowed the transportation of the orbiter from the OPF to either the SCA "Mate-Demate" stand or the VAB without placing any additional stress on the undercarriage. The Crew Transport Vehicle (CTV), a modified airport jet bridge, was used to assist astronauts to egress from the orbiter after landing. Upon entering the CTV, astronauts could take off their launch and re-entry suits then proceed to chairs and beds for medical checks before being transported back to the crew quarters in the Operations and Checkout Building. Originally built for Project Apollo. The Astrovan was used to transport astronauts from the crew quarters in the Operations and Checkout Building to the launch pad on launch day. It was also used to transport astronauts back again from the Crew Transport Vehicle at the Shuttle Landing Facility. The three locomotives serving the NASA Railroad, used to transport segments of the Space Shuttle Solid Rocket Boosters, were determined to be no longer needed for day-to-day operation at the Kennedy Space Center. In April 2015, locomotive No. 1 was sent to Natchitoches Parish Port and No. 3 sent to the Madison Railroad. Locomotive No. 2 was sent to the Gold Coast Railroad Museum in 2014. Atlantis being prepared to be mated to the Shuttle Carrier Aircraft using the Mate-Demate Device following STS-44. ^ Launius, Roger D. "Space Task Group Report, 1969". ^ a b "International Space Station Historical Timeline". ^ "Breaking News | Shannon to review options for deep space exploration". Spaceflight Now. August 29, 2011. Retrieved 17 May 2012. ^ a b c d e Hepplewhite, T.A. The Space Shuttle Decision: NASA's Search for a Reusable Space Vehicle. Washington, DC: National Aeronautics and Space Administration, 1999. ^ Callahan, Jason (October 4, 2014). "How Richard Nixon Changed NASA". ^ Rebecca Onion (November 15, 2012). "I Say "Space Shuttle," You Say "Space Clipper"". Slate. The Slate Group. Retrieved 25 November 2012. ^ a b Borenstein, Seth (July 5, 2011). "AP Science Writer". Boston Globe. Associated Press. Retrieved 5 July 2011. ^ Brooks, Dawn (date unknown). The Names of the Space Shuttle Orbiters. Washington, DC: National Aeronautics and Space Administration. Retrieved 26 July 2006 from "The Names of the Space Shuttle Orbiters". Archived from the original on June 14, 2006. Retrieved July 26, 2006. .
^ "Space Shuttle Unveiled". A+E Networks. 2010. Retrieved December 19, 2016. ^ a b c d e "Columbia's White External Fuel Tanks". ^ "Space Shuttle Weather Launch Commit Criteria and KSC End of Mission Weather Landing Criteria". KSC Release No. 39-99. NASA Kennedy Space Center. Archived from the original on June 26, 2009. Retrieved July 6, 2009. ^ a b c Logsdon, John A. "Return to Flight...Challenger Accident". ^ "NASA, Partners Update Commercial Crew Launch Dates". NASA Commercial Crew Program Blog. ^ Administrator, NASA (March 6, 2016). "Independence Day at NASA Dryden – 30 Years Ago". ^ a b c d e "Spacelab joined diverse scientists and disciplines on 28 Shuttle missions". NASA. March 15, 1999. Retrieved February 11, 2011. ^ Comptroller General (1972). "Report to the Congress: Cost-Benefit Analylsis Used in Support of the Space Shuttle Program" (PDF). United States General Accounting Office. Retrieved November 25, 2008. ^ a b NASA (2011). "How much does it cost to launch a Space Shuttle?". NASA. Retrieved June 28, 2011. ^ David, Leonard (February 11, 2005). "Total Tally of Shuttle Fleet Costs Exceed Initial Estimates". Space.com. Retrieved August 6, 2006. ^ Berger, Brian (February 7, 2006). "NASA 2006 Budget Presented: Hubble, Nuclear Initiative Suffer". Space.com. Retrieved August 6, 2006. ^ Pielke Jr., Roger; Radford Byerly (April 7, 2011). "Shuttle programme lifetime cost". Nature. 472 (7341): 38. Bibcode:2011Natur.472...38P. doi:10.1038/472038d. PMID 21475182. ^ Foust, Jeff (2017-11-20). "Review: The Space Shuttle Program: Technologies and Accomplishments". The Space Review. ^ "Roland Statement". NASA. Retrieved 18 June 2018. ^ Weinrich, Heinz (2013). Management: A Global, Innovative, and Entrepreneurial Perspective. p. 126. ^ Klikauer, Thomas (2016). Management Education: Fragments of an Emancipatory Theory. p. 220. ^ Keuper, Franz (2013). Finance Bundling and Finance Transformation: Shared Services Next Level. p. i. ^ "Dumping NASA's New Ares I Rocket Would Cost Billions". ^ President George W. Bush (Attributed) (2004). "President Bush Offers New Vision For NASA". nasa.gov. Retrieved January 14, 2004. ^ "Space Shuttle Atlantis Exhibit Opens with Support from Souvenirs". ^ "Space Shuttle Endeavour homepage". ^ a b "Human Space Flight (HSF) – Space Shuttle". ^ a b (www.spacefuture.com), Peter Wainwright. "Space Future – The Future of Space Tourism". ^ a b c d e (www.spacefuture.com), Peter Wainwright. "Space Future – The Space Tourist". ^ a b "Politics played a big role in why NASA doesn't already have a new spacecraft to replace the retiring space shuttles. Funding and technical challenges put a stop to any attempts to build the ' Space Shuttle 2.'". ^ a b c "Reusable Launch Vehicle". ^ "X-38 project's cancellation irks NASA, partners". ^ "NASA Selects Crew and Cargo Transportation to Orbit Partners" (Press release). NASA. August 18, 2006. Retrieved 21 November 2006. ^ Bergin, Chris (October 6, 2011). "ISS partners prepare to welcome SpaceX and Orbital in a busy 2012". NASASpaceFlight.com (Not affiliated with NASA). Retrieved December 13, 2011. ^ "NASA Commercial Crew Program Mission in Sight for 2018". NASA. January 4, 2018. Retrieved April 14, 2018. ^ a b c Bergin, Chris (February 23, 2012). "Acronyms to Ascent – SLS managers create development milestone roadmap". NASA. Retrieved April 29, 2012. ^ Bergin, Chris (March 26, 2012). "NASA Advisory Council: Select a Human Exploration Destination ASAP". NasaSpaceflight (not affiliated with NASA). Retrieved April 28, 2012. ^ Olson, John; Joel Kearns (August 2008). "NASA Transition Management Plan" (PDF). JICB-001. National Aeronautics and Space Administration. ^ "NASA Railroad rides into sunset". Florida Today. Wikimedia Commons has media related to Space Shuttle program.